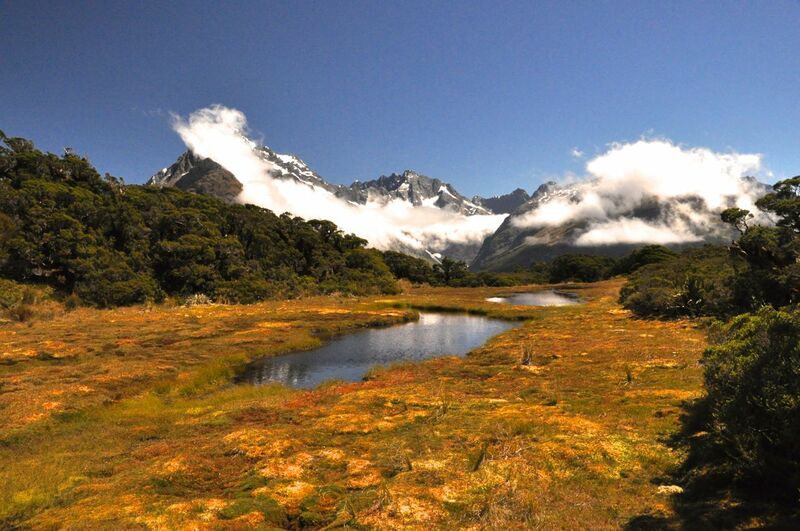 Fiordland is unmatched for stupendous landscapes. On our way out of Milford Sound we plan to hike a piece of the Routeburn Track, one of the finest of NZ’s “Great Walks” (multi-day tramps). 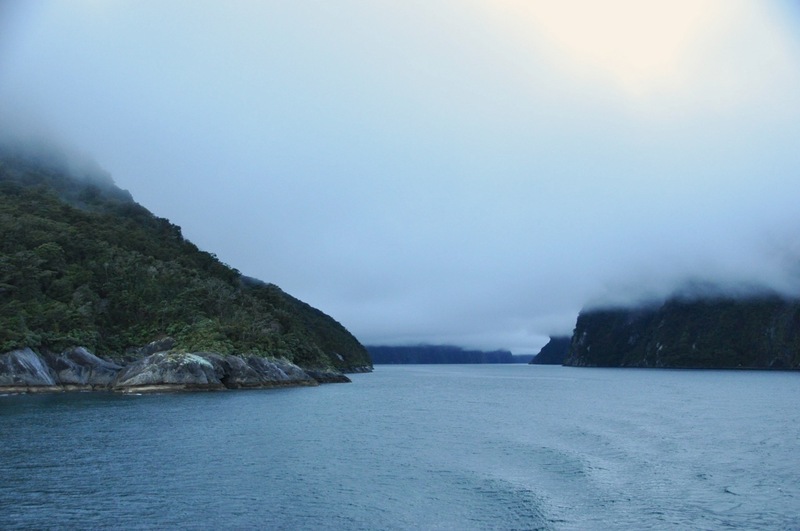 It’s turning out to be a beautiful sunny day – we don’t know whether to cheer or curse our fate of yesterday (post of April 17, Milford Sound). We decide to cheer – hard to stay grumpy on a sunny day! 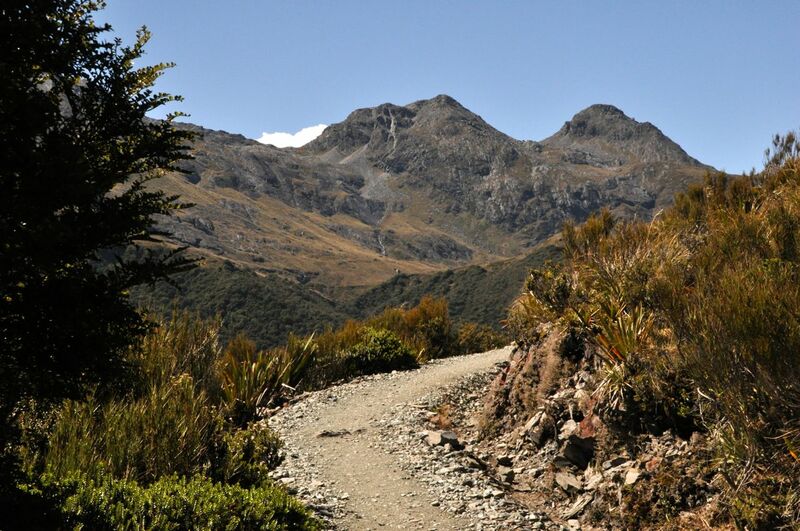 The Routeburn track has an interesting twist. 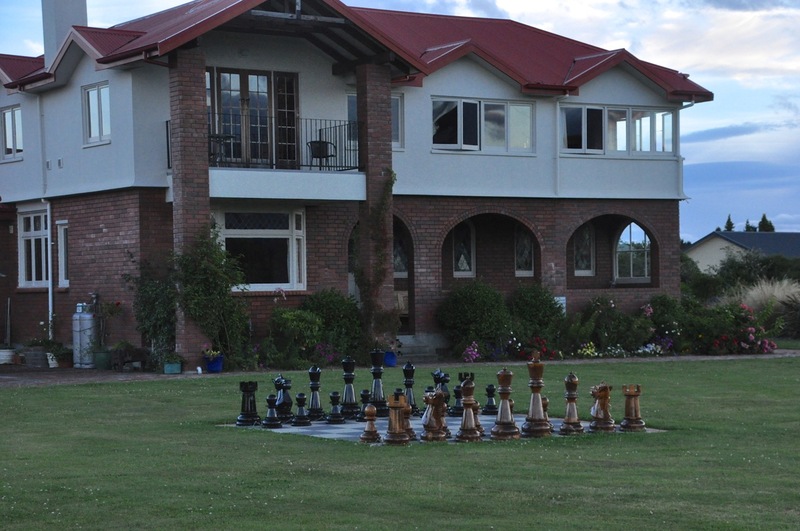 Remember we took two – admittedly leisurely – days to drive to Milford Sound from just above Queenstown (post of April 13, Fiordland National Park and Milford Sound – Getting There) . On the other extreme, tour buses from Queenstown drive to Milford Sound and back in one very long day. 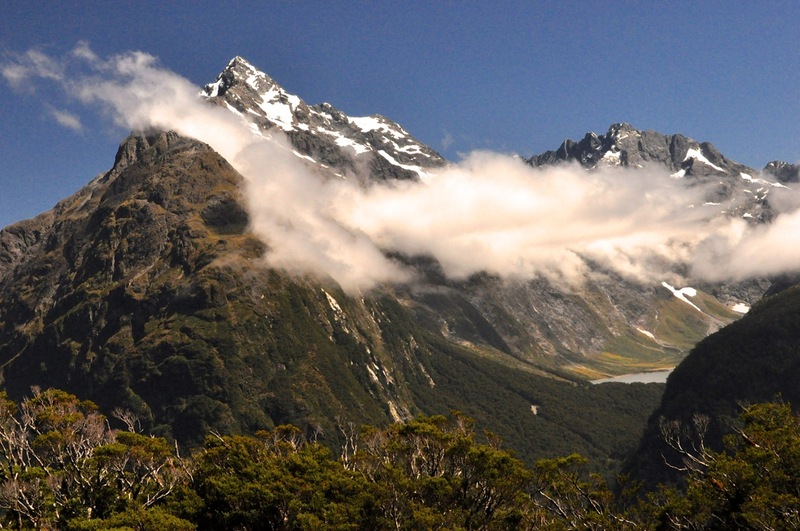 The interesting story is that one can use the Routeburn Track to walk from Queenstown to (just above) Milford Sound over the Southern Alps in just 2 (long) days; it’s only 20 miles! 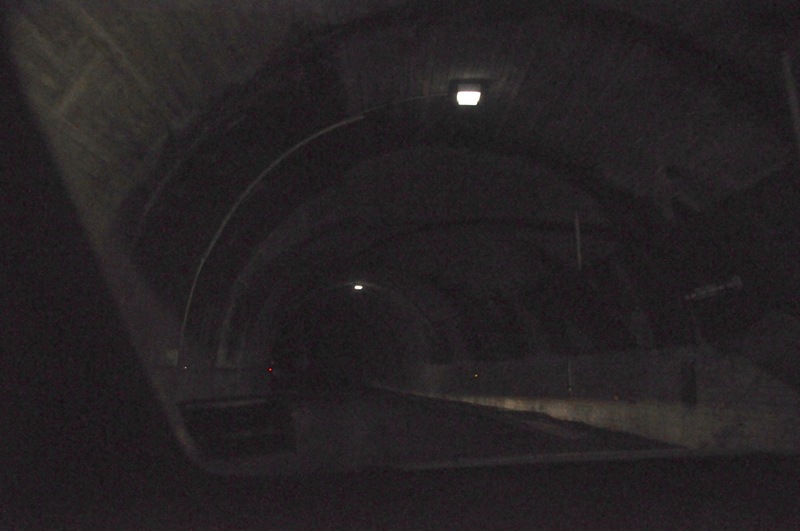 So why not build a short highway across the mountains to link the two tourist destinations? 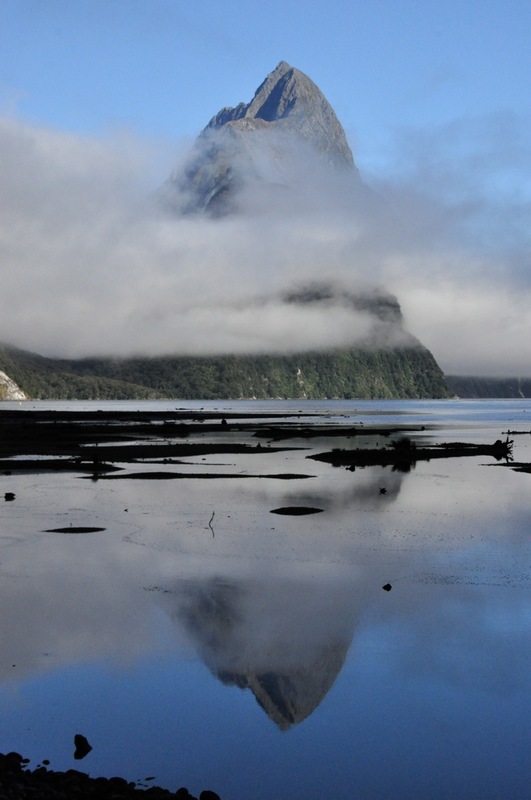 The answer is twofold – one, Milford Sound already gets plenty of tourists in spite of the travel hurdles. Two, if they built the highway, the city of Te Anau (Gateway to Milford Sound) would cease to exist. So NZ wisely embraces the status quo. 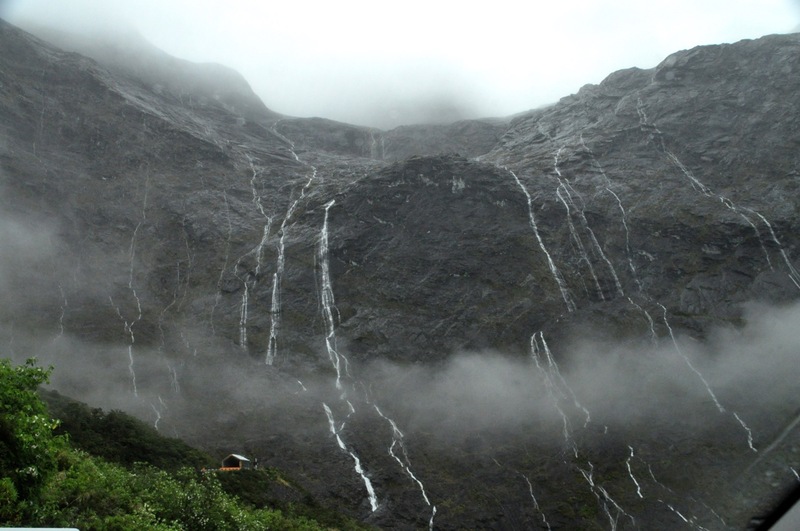 The Routeburn track is very green and pretty, as one might expect from the rainfall. As you can see in that last picture above, the banks of the trail (horizontal and vertical!) are solid with moss and ferns. Other areas have banks that are chock-a-block full of lichen. Sometimes the ferns are a solid mass going up the hillsides, just a forest of ferns (picture not shown). It’s all very colorful! Occasionally we encounter small waterfalls. After an hour or so of steady upward climb, Ginger decides this is not her day to hike and turns back. I’m feeling great and will push on. Soon thereafter the trail to Key Summit splits from the Routeburn. I take the Key Summit trail which heads up even more steeply. Soon the forest ends abruptly, the view opens up, and I’m hiking past sub-alpine plants. The picture to the left, below, looks back at the valley where we started, the other picture is the increasingly pretty view ahead. The flora is interesting, with a fuzzy ground cover and a number of small wildflowers like the genetian. Finally I’m at the top, and it’s quite a pretty view from this small summit, with mountains absolutely surrounding it. The small tarns and yellow ground cover/grass add to the beauty! Looking more closely, I see that there is also a lot of red here, adding to the very pleasing palette of colors. There’s red algae in some of the tarns, red lichen on the rocks, and a thick red moss on most of the tree trunks and limbs. I’m loving the feast of colors! The trail doesn’t really stop here; it seems to wander off in several directions, including a “nature walk”. I decide to wander as well, going up, of course. There’s a hill ahead. One of the advertised “sights” from the Key Summit is the view of three valleys that intersect here, the great conjunction. You can sense – if not see – them in the pictures below; the first picture shows a valley over the left side of the summit, the next showing that valley joining another and falling away, the third picture showing the joining valley over the right side of the summit, and the last picture hinting at the third valley that’s coming in, but the view is blocked by the hill ahead. As I’m walking up the hill, I come to an opening with a bench, and a sign saying there’s a view of Lake Marian. Sure enough, there’s a glacial cirque with a lake – always a pretty sight! Alas, there is just a snippet of the lake showing. As I’m watching, a guide with a customer shows up and says the trail continues up the hill for a better view. I’m on it! However, there is no obvious trail anywhere, things seem to end here. As I walk up the hill, a trail does emerge – a footpath, really, and not used much. I do pass some more quite beautiful tarns. After some climbing the steep footpath then leaves the open tundra to go into a forest of short trees with the red moss. The trail becomes almost hidden in the plants, and then becomes nothing but mud and roots and hauling yourself up by grabbing tree trunks – you really have to want to go here! It is also taking me longer than anticipated. Finally I’m out of the woods, and there is a good view of Lake Marian! It looks like a pretty fabulous place to pitch a tent, over there. Lake Gunn that we visited yesterday. Key Summit is definitely a pretty place! Alas, I have taken longer than planned, the long-suffering Ginger is patiently (?) waiting (lucky for me she keeps her Kindle in the car), so even though the path continues up, I’d better go back. More’s the pity! The problem with a day hike into NZ’s multi-day Great Walks is that you do the tough vertical climbing to get to the pretty areas, then once there, with easier hiking and all the best views still ahead, you turn around and go back down. Still, the half-loaf is worth it (and I didn’t have to carry a heavy backpack). Below are two pictures taken on the way down of the pretty tarns and the red ground cover with berries. On our way back out Milford Road, we stop at Lake Gunn to see it in the sun – it’s a pretty place, with very clear water. 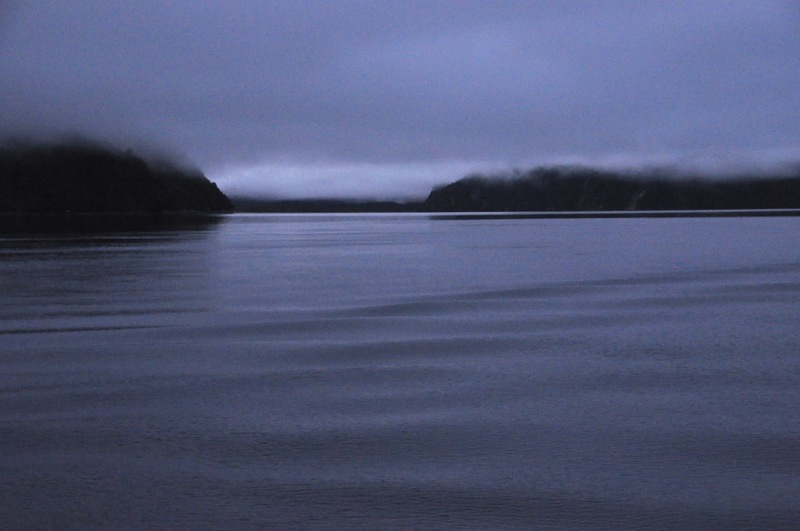 For comparison I’ve included our picture of Lake Gunn from yesterday. The valleys are also much prettier in sun. 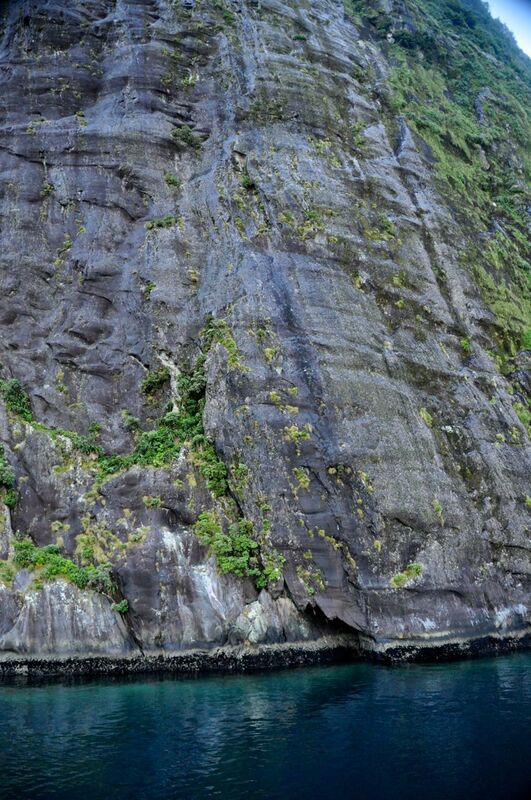 That’s it for Milford Sound! Hope you enjoyed the trip up Routeburn. Next stop, the Scottish city of Dunedin.